I know I haven’t posted in almost a week, but I have been swamped. I am a full-time student ( as I stated in my mini bio) and it is finals week. That means, while I have been cooking 🙂 I haven’t had time to blog about it :(. So, obviously, I have a little catching up to do. Well, I found a good, rich, moist chocolate cake recipe and started with that. The cake came out great. It smelled wonderful, didn’t stick to the pan at all, it was lovely! While it cooled, I started searching around for a good strawberry cream cheese frosting, thinking that the cream cheese would cut the sweetness a bit. I finally found what I though would be a good one and commenced beating the butter and cream cheese together. everything seemed fine until I got to the Strawberry puree. 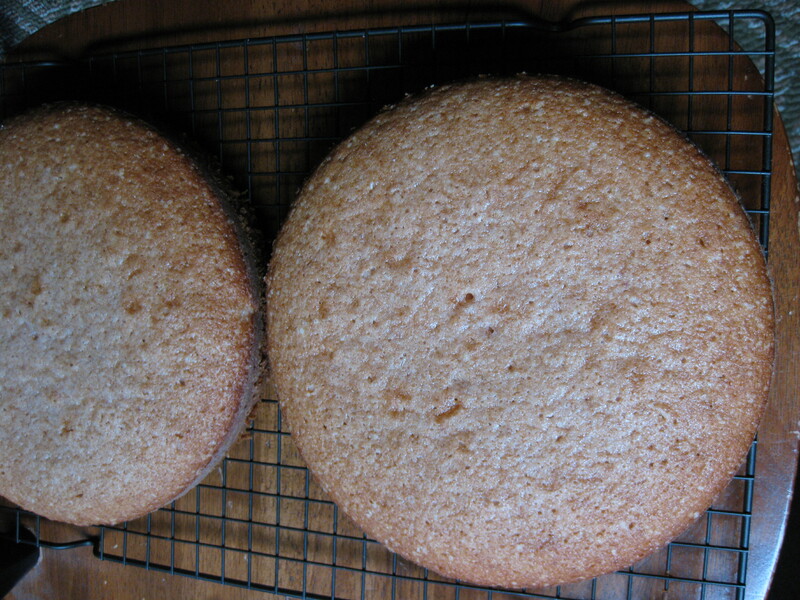 The recipe was not very clear on quantities, and well, lets just say I got it WRONG! It was so soupy I had to add double the powdered sugar the recipe called for to get it even close to thickening up, and it still was just too soft. I scrolled down the blog to see other people’s comments and the original poster of the recipe had posted a note saying it may help to stick the icing in the fridge for a bit to help it stiffen up. Ah, I thought, my saving grace! So I covered the icing and stuck it in the fridge, popped in a movie and chilled (hehe) for about an hour. Ugh, I was so disgusted! I sat down at the table with a Bellini (cheap champagne and about a tablespoon and a half of the leftover strawberry puree) and just watched the icing fall off the cake. This is where hubs found me when he got home from work at about midnight. He knows me well enough now to point out the GOOD parts and ignore the bad, so he says “the house smells good, like really good chocolate”. I looked at him, downed the rest of my drink , stood up with cake platter in hand and resolutely dumped the whole thing in the trash. I was just done with it. 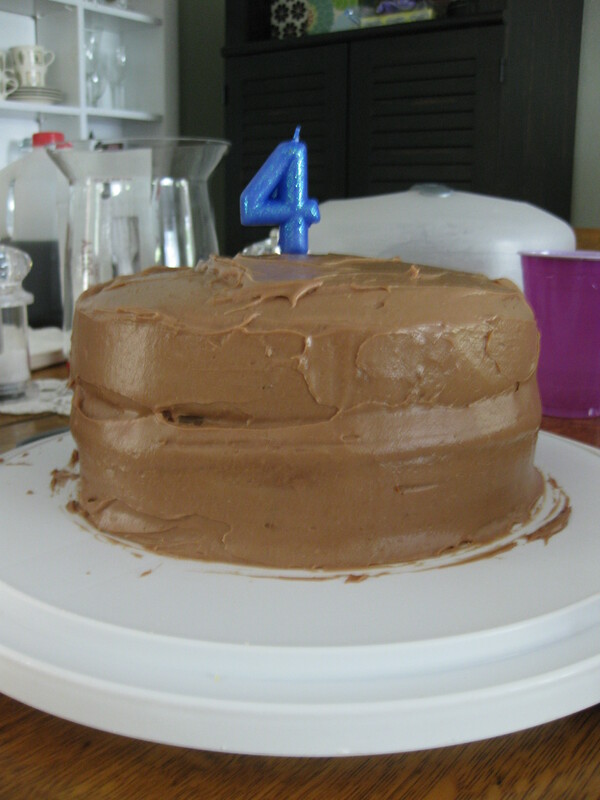 The next morning, I asked my little bear if I could switch his cake around. It was his birthday cake after all, and I wanted to give him the choice. He, of course, so sweet, asked why and when I explained he said “yeah, sure” in his quirky little voice (he was only three). My heart smiled and I got to work. Looked good, smelled good and, I prayed, tasted good. Now for the frosting. I am the first to admit that I love Buttercream frosting. However, I do NOT like large quantities of Homemade buttercream, it is (usually) way to sweet, like enough to make your teeth hurt kind of sweet. I did not want that so I set about finding one that incorporating cream cheese. Using that and some really good bittersweet chocolate, I managed to offset the sweetness of the powdered sugar. The frosting was thick, creamy and, THank you, Lord! It was stiff, the way a good frosting is supposed to be! Spreadable and stayed in place :). I finished the cake, stuck it in the fridge and got myself and everyone else ready to head to my mom’s house for Bear #3’s family birthday party. Here is the finished product, which everyone told me tasted delicious :). My birthday bear was happy with his cake and I was satisfied. My work was done :). Since this cake I have made a few more scrumptious sweet things as well as the savory, so I will be writing about them (very?) soon ;), so Stay Tuned…..
← And the award goes too…..
Caramel Apple Upside-down Cake and Delicious Chicken! Trip to Disney and California ......maybe? Gotta start saving!! !